What are the differences between Aurora HDR Standard vs Pro? Here's our getting started guide. The following is a comparison review of the Aurora HDR Basic (Standard) vs Pro versions. This photo editing software is a "high dynamic range" specialized photo editor. If you're looking for more information on Luminar, a general photo editor, click here. I'm pretty new to HDR editing tools, but I'm been in photography for a few years now. If you're like me, you've been super impressed and rather baffled by some of the images you've seen shared on platforms like Instagram. Below are a few of the first images I've edited using Aurora HDR Pro. It's amazing how the images "pop" like that! The color and clarity is really pretty awesome. Below is a gallery of the very first images I've edited using an HDR photo editing tool - Aurora, in this case. If you're a fan of bright, vibrant colors and deep contrasts, then you really should check out Aurora HDR by Macphun! See what I mean? I set out to teach myself how to make my own photos look like this! I started looking for a photo editor that could help me create super-vibrant, color-rich edits of my photos. That's when I came across the Aurora HDR (af) software from Macphun. Aurora HDR (Basic or Pro) is a photo editing tool that makes turning your photos into HDR versions super easy, even for a novice (like me). Take note, Aurora is available only on Mac right now, so be sure you've got the proper hardware before purchasing. What are the differences between the three options of Aurora HDR and "Basic" vs "Professional"? The pricing table provided on AuroraHDR.com helps to explain the differences, but what do they mean and are the higher priced options worth the extra investment? #1 - Increase in layers from 5 in standard to 10 in Pro. If you're at all familiar with products like Adobe Photoshop, you should have an idea of what layering means in Aurora HDR as well. The practice of layering a photo allows you to apply different effects to various parts of the photograph, rather than applying the change to the entire photo. The more layers you have access to, the more changes you can apply to isolated parts of the image. Here's a great video from the makers of Aurora HDR providing an introduction to using layers in Aurora HDR. #2 - From 3 brackets in Aurora Basic to an unlimited number of brackets in Pro. HDR photos are created typically from merging multiple photos into a single image. This is known as "bracketing" your photos. Bracketing is a process where multiple photos are taken at various exposure levels. The standard version of the software will only allow you to "merge" up to seven photos together, while the pro version lifts this limit. Presumably, the more brackets you have, the better the outcome of the finished HDR photo. #3 - Aurora HDR Pro includes Trey Ratcliff signature HDR presets. I know what you're thinking - they're just presets. But the presets provided in the pro version produced by the famous HDR photographer are a really great addition to an already good tool. If you're more familiar editing HDR photos, then you may just want to create your own presets. Otherwise, additional presets will help you get started even faster with the tool. #4 - Adobe & Apple plugin support included in the Pro version. The pro version of the Aurora software comes with the ability to install two Adobe plugins (for Photoshop and Lightroom) as well as a plugin for Apple's Aperture photo editing software as well. I'm fairly versed in Adobe Lightroom 5.x, but don't have a lot of experience in Photoshop or Apple Aperture. The plugins should bring Aurora HDR functionality into those environments, but I haven't gotten into testing this functionality just yet. #5 - Ghost reduction included in the Pro version. No, the Aurora software program isn't haunted by ghosts. "Ghosting" is what happens when there are slight variances in your photos, either due to the camera moving or the subject(s) in the photos moving. 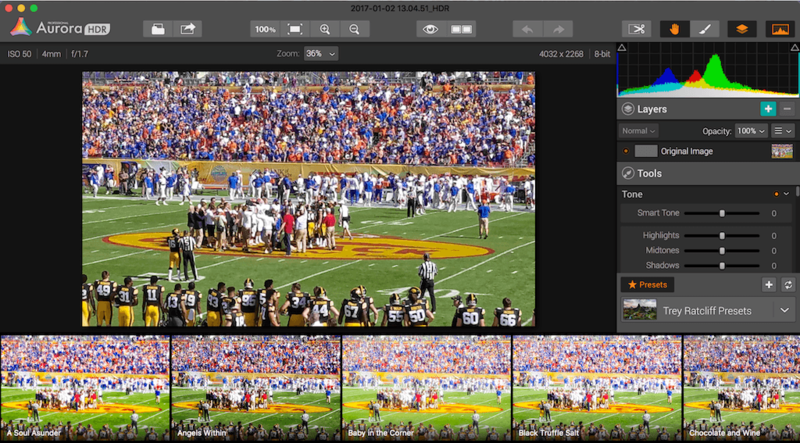 I found this to be a must-have feature, especially as you include more bracketed photos in your final HDR version. To illustrate how great this feature is, I performed the same HDR action on a set of 3 images. In the first one, I didn't include the auto removal of ghosts and on the second one I did. Check out the differences in these photos. The first photo shows major "ghosting". Do you see the "Universe of Energy" sign? Now look at the 2nd photo. Do you see how it's not ghosted? Aurora HDR eliminated that automatically. #6 - Native RAW and DNG file support in the Pro version. When I first started shooting, I honestly had no idea what "RAW" photos even were. Once I figured out the power of RAW, I haven't shot anything else since. While the use of RAW files may be considered an advanced functionality, it's one that most photographers move to as they get better at photography. For those more serious about HDR editing, native RAW and DNG support is a must-have. I shoot Samsung cameras currently, so the camera captures an .SRW file as the RAW camera file. I then convert to an Adobe .DNG file (digital negative) and import into Aurora for editing. According to the software developer, CR2, .NEF, .ORF, .RAF, .ERF, .ARW, .RW2, .PEF "and more" RAW file formats are currently supported. #7 - Adobe PSD file support in the Pro version. Again, I think this is likely a feature most interested to those that are already pretty advanced in photo editing. Being able to output files from Aurora HDR in a PSD format and then "natively" pull them into Adobe Photoshop has some pretty clear benefits. If you don't use Adobe Photoshop, this feature may not be of interest to you. #8 - eBook by Jeff Carlson provided in the Pro with Bonus version. Macphun already has a ton of educational content available. I particularly like their videos on YouTube. However, if you really want to get a head start on how to use the application, it seems like the eBook by Jeff Carlson provides just about everything you'd care to know about how Aurora HDR works. The free ebook is a $9 value compared to purchasing it separately. Just in case you're interested, here's the entire 35-video set on Aurora HDR from Macphun on YouTube. 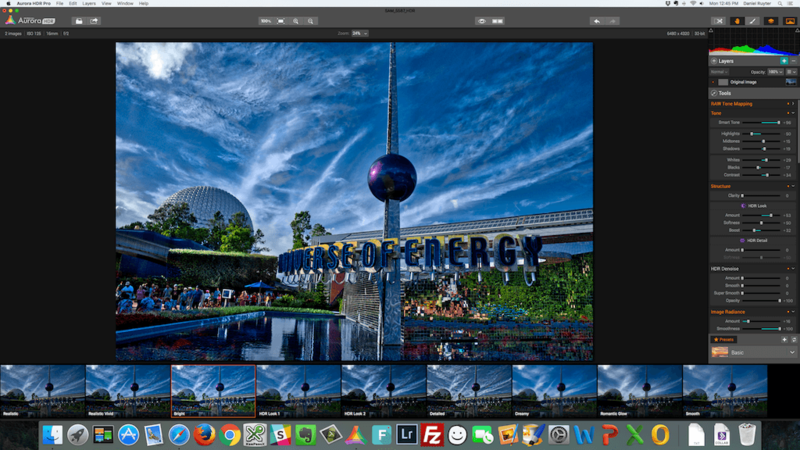 Have you tried Aurora HDR? Share your thoughts about this photo editing software in the comments below.